Looking for ways to get your students excited about sound? 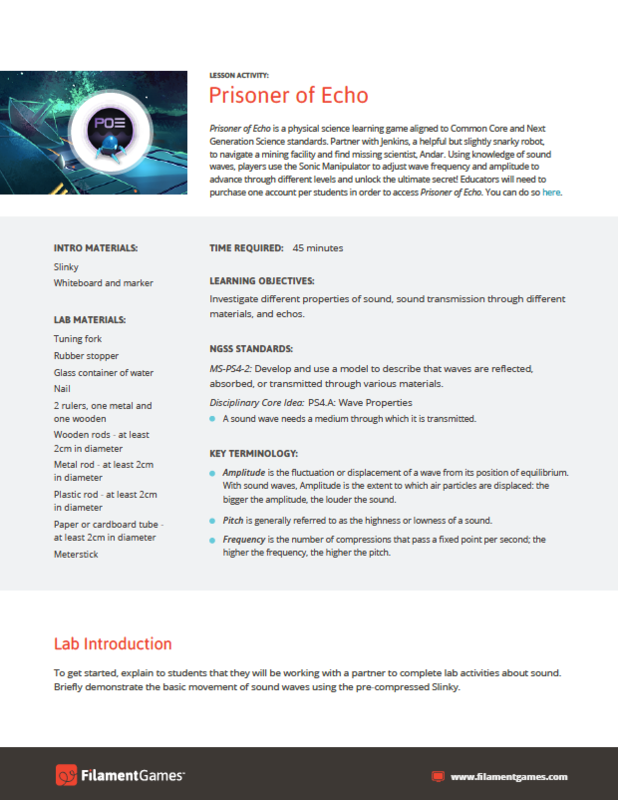 The activity below is included in our free game-based learning curriculum and can be used in conjunction with sound and amplitude learning game Prisoner of Echo. Try out this fun classroom activity with your students and view more sound and amplitude curriculum activities here! Amplitude is the fluctuation or displacement of a wave from its position of equilibrium. 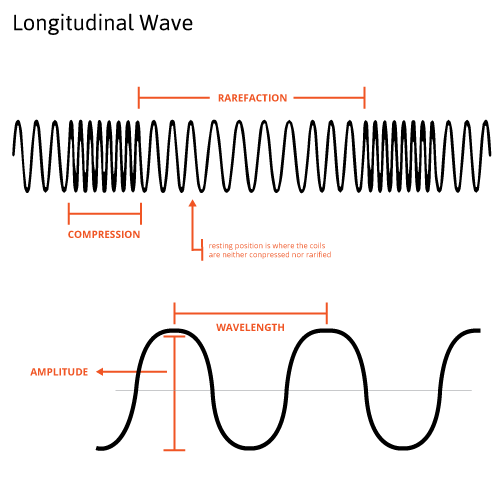 With sound waves, Amplitude is the extent to which air particles are displaced: the bigger the amplitude, the louder the sound. Pitch is generally referred to as the highness or lowness of a sound. Frequency is the number of compressions that pass a fixed point per second; the higher the frequency, the higher the pitch. To get started, explain to students that they will be working with a partner to complete lab activities about sound. Briefly demonstrate the basic movement of sound waves using the pre-compressed Slinky. Hold up the Slinky and vibrate the first coil back and forth horizontally. Explain that this illustrates the movement of sound waves. The wave bouncing back toward your hand illustrates an echo. Point out that the parts of the spring represent air molecules that vibrate back and forth. Sound waves are longitudinal waves because the air particles that vibrate move back and forth in the direction of the wave movement. Draw a diagram on the board of a longitudinal wave similar to the one above. Point out each part of the wave as you review the diagram. Explain that a wavelength is measured as the distance between the centers of two compressions. The loudness, or intensity, of a sound depends on the amplitude of the sound wave. Distribute the Lab Sheets included below and have students review the introduction and materials lists. As they are reading, distribute the lab materials to each student pair. Review the procedural steps as a class, including any safety and cleanup protocols students should follow when working with the materials. After all students have completed the lab, it’s a great idea to review their lab summaries as a class. This gives students the opportunity to discuss what they’ve learned and hear about the experiences of their classmates.